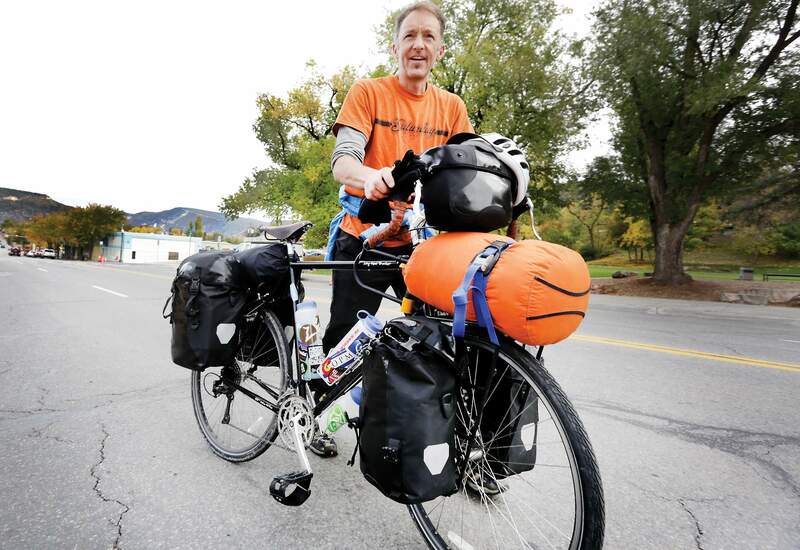 Matt W. Dawson stopped in Durango to make gear adjustments Thursday before a 25,000-mile bicycle journey around South America. For the last three years, Matt W. Dawson of Logan, Utah, has been living in China, working as a high school principal. At the end of the school year, he began feeling up for a challenge. Why not ride the coast line of South America, and he’s passing through Durango to get there. Dawson is well on his way. He’s already been to 80 nations. A natural born wanderer, he began thinking of how to slow down his travels. To see more, he considered hiking. “Insane,” he said. Then he thought of bicycling. And that’s the magic word. Dawson is always looking for something new. He’s taught school in Asia. Built houses in Costa Rica, worked in Tijuana, and now, this. Dawson’s bumped into a bit of trouble, but nothing he couldn’t handle. Eight days of rain around the Utah-Colorado desert border, then some mechanical issues, slowed him. At one point, he forgot to pack anything to eat. But there’s one thing he couldn’t help noticing: kindness. With his cellphone and a low-cost computer, and a few friends following him for updates on social media, Dawson is heading for the sea of Cortez next.